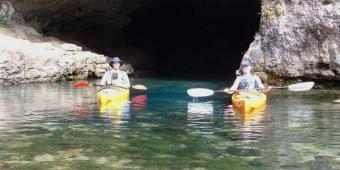 New Mexico Kayak Instruction offers whitewater and sea kayak instruction, sales, rentals and adventure travel. Beginner and Intermediate classes are taught year-around in Albuquerque, Santa Fe & Los Alamos, NM. Kayaking has taken me places roads and trails don't go. Teaching has introduced me to some of my best friends, and rivers have taught me lessons that only nature and experiences can teach. It's been a goal of mine, since the very beginning, to share these experiences with you. Learn more. New Mexico Kayak Instruction offers kayak lessons for beginners all the way through advanced whitewater kayaking in pools, lakes and rivers thoughout New Mexico. 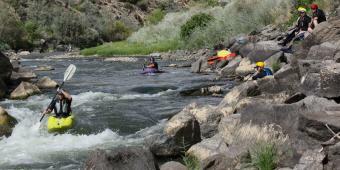 Intro and kayak roll classes are taught weekly in Albuquerque. 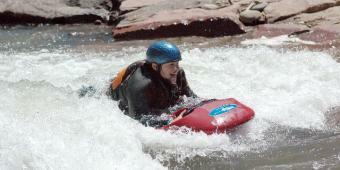 Whitewater classes are taught monthly near Taos and Touring classes annually at Abiquiu Lake. 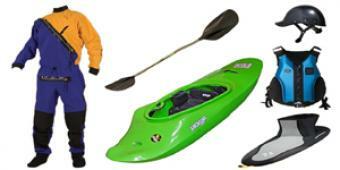 New Mexico Kayak Instruction is the largest retailer of whitewater, touring and fishing kayaks in New Mexico. The reason behind our success is simple: Nowhere else in New Mexico can you demo a variety of modern kayaks before you buy. New Mexico Kayak Instruction has the largest selection of kayak rentals in New Mexico. With more than 30 2008-2010 whitewater, recreational, touring and fishing kayaks in Albuquerque, you're sure to find the perfect kayak for your next adventure! River Boarding is headed to New Mexico! Check back soon for River boarding instruction, sales and adventure travel! Currently there are no Guided Tour - Rio Grande Kayak Tours scheduled. Please see our Calendar of Events for upcoming Intro, Roll, Whitewater and Touring clinics, or Contact Us to schedule a tour for groups of 6 or more! Currently there are no Guided Tour - Balloon Fiesta scheduled. Please see our Calendar of Events for upcoming Intro, Roll, Whitewater and Touring clinics, or Contact Us to schedule a tour for groups of 6 or more! Currently there are no Guided Tour - Specialty Kayak Tours scheduled. Please see our Calendar of Events for upcoming Intro, Roll, Whitewater and Touring clinics, or Contact Us to schedule a tour for groups of 6 or more! Currently there are no Guided Tour - Corporate Team building basic scheduled. Please see our Calendar of Events for upcoming Intro, Roll, Whitewater and Touring clinics, or Contact Us to schedule a tour for groups of 6 or more!